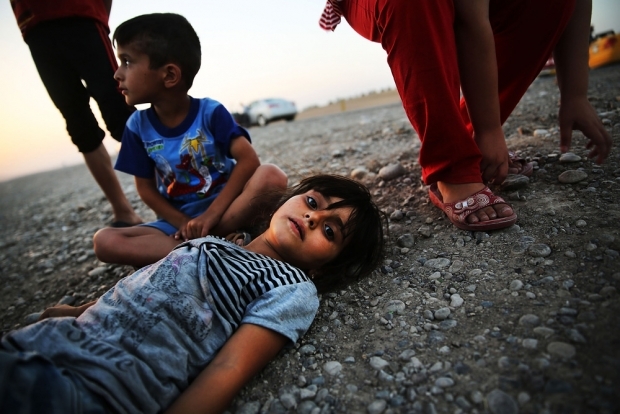 Iraqi children who fled fighting near Mosul prepare to sleep on the ground after their families tried to gain entrance to a temporary displacement camp blocked by Kurdish soldiers, July 3, 2014 in Khazair, Iraq. Tens of thousands of people have fled Mosul, Iraq's second largest city, after it was overrun by ISIS (Islamic State of Iraq and Syria) militants. Richard Bernstein: Of course, they should. But can they? Since the attacks of Sept. 11, 2001 in the United States, China has defined almost any dissent from its policies there as examples of international terrorism. It has also consistently tried to win western acquiescence in its suppression of the Uighurs by claiming that all Uighur protests, whether peaceful or violent, against China’s harsh rule in Xinjiang amount to terrorism. For well over a decade, China’s propaganda has identified a group it calls the East Turkestan Islamic Movement, or ETIM, as a main instigator of Uighur violence in China, saying that ETIM has training camps in the borderlands of Afghanistan and Pakistan and is closely linked to al-Qaeda. Given the absence of peaceful avenues of protest and the mounting frustrations of many Uighurs, it is certainly possible that some Uighurs have joined extremist Muslim groups, and perhaps have instigated some of the Uighur violence. Still, China has been able to produce no persuasive evidence that any Uighurs at all, much less a significant number of them, have actually joined the international jihad. Still less has it demonstrated that Uighur violence in China is anything other than local rage at China’s various methods of control, rather than part of the international jihadist movement. This could be a positive step. If China chooses to make a real contribution against real, as opposed to imaginary, terrorists, that would, of course, be welcome. But so far, the indication is that that China will attempt to use the new situation, as it did the attacks on 9/11, to divert attention from its repression of peaceful and lawful dissent in Xinjiang, illustrated most recently and most starkly by the life sentence meted out to the peaceful Uighur scholar-dissident Ilhan Tothi. If the rest of the world allows this “cooperation” to take place, it will not be so much gaining Chinese help in the real anti-terrorism fight as it will be collaborating in China’s ongoing violations of the rights of its Uighur citizens. However unappreciated in Beijing, these comments reflect the commonly heard sentiment that China, given its decades of remarkable economic growth and robust military modernization, is surely at the point now where it could make more substantive contributions to the international community. And while Beijing is quick to highlight its economic and humanitarian assistance to the Middle East, these are obviously no substitute for participating in more costly, risky and difficult overseas military operations. There’s some logic to the notion that counterterrorism might just be the area for China to step up and cooperate with the United States. After all, Beijing is now struggling with a burgeoning domestic terrorism problem characterized both by a recent spate of attacks at home and the reported arrest of ISIS-inspired Chinese nationals traveling to the Middle East and Southeast Asia. Nevertheless, the constraints are likely to overwhelm any such incentives. Beijing appears happy to continue allowing the United States to bear the financial and reputational cost of being on the front lines in the Middle East, wary of making itself a bigger target for Islamic extremists. China’s support for the Assad regime in Syria and its allergy to American military intervention only complicate matters further. Limited counterterror cooperation between the United States and China is always possible, and may in fact already be happening. Leading officials from the two countries certainly discuss the Middle East and it’s not impossible, for example, to imagine Beijing sharing the names of persons of concern or relaying information and messages from Tehran and Damascus. That said, regardless of overlapping interests, it is unlikely under the current circumstances that China will make a significant contribution to counterterror operations in Iraq and Syria. The U.S. and China should cooperate on countering terrorism, but that does not mean that any substantive coordination will take place. While ISIS’ rise within Syria and Iraq brings new attention to the idea of cooperation, countering terrorism has been a discussion point for some time in regards to South Asia, specifically Afghanistan. Nothing of substance has emerged from these conversations, nor should anyone expect cooperation to emerge from the same conversations regarding the Middle East. The U.S.’ hang-ups should be mentioned, for they are also hesitant about cooperation. First, U.S. security sectors do not want to engage with the Chinese in ways that would benefit China’s operational capability. There are questions about China’s human rights stance and if cooperation in the realm of countering terrorism will be used by Beijing to attack political dissent within Chinese borders. China’s hesitation to cooperate is based on numerous issues, including its long-favored ideology of non-interference and respect for sovereignty, fear of extending beyond national capability, and a desire to maintain the status quo that allows China to free ride off the security guarantees of others. In the short run, China’s approach may prove beneficial, but in the long run, trends are emerging that necessitate China becoming a more active player in the Middle East. For starters, China’s need for energy is not going to diminish anytime soon and even with alternative sources being developed, Beijing will rely on natural gas and petroleum deposits in the Gulf region. Price fluctuations stemming from regional instability will have a more direct and immediate impact on the Chinese economy. China has no choice but to become a more involved actor with regional states in order to protect their national interests. While this does not mean China will necessarily become more active in the security arena, it will become a more active diplomatic actor. China’s plan for an overland economic corridor through Asia and its greater investment in regional institutions like the Shanghai Cooperation Organization reveal that China’s eyes are not merely fixed to its east, but also its west. Central Asia, South Asia, and the Middle East offer economic opportunities that China must exploit to continue to fuel its economy. The added bonus of Beijing’s western view is that while eastern neighbors are today uncomfortable with China’s growing strength, its western neighbors are far less worried. China remains a bit of a wild card within the context of the Middle East. It has never been very active diplomatically in the region and has only recently become a major economic player. As such, Beijing can be naïve—believing their greater investment in the Middle East will come without the risk of becoming entangled in regional disputes. Perhaps with time and some lessons learned, both the U.S. and China will find a way to cooperate on counter terrorism. When it comes to mendacity, incompetence, insensitivity, corruption, profiteering, fear-mongering, invasion of privacy, and deceiving the public, there’s often little difference between the U.S. and Chinese terror-security establishments anyway, save that the US side does most of its worst business abroad and the Chinese do it at home. (The US merely deploys machine-gunned armed police against its minority populations; unlike China, it doesn’t open fire on the crowds.) Most deals with the Chinese state involve compromising or abandoning values, but in this case there seems to be little left to lose. Morally, if we’re happy to deal with Riyadh, why not Beijing? From an entirely pragmatic perspective, anti-terrorism “cooperation” has decent PR value on both sides. I doubt it will be of much practical use; Beijing has no desire to lessen the price of US mistakes in the Middle East or Afghanistan, and if it feels its own interests threatened will act anyway. Equally, the US has no desire to ease the costs of China’s blundering policies in Xinjiang. China will make its usual efforts to cast all Uighur resistance as terrorism; the US will, with any sense, ignore it. Both sides will, and probably should, assume that much of the intelligence provided by the other is done in bad faith. China is likely to find a more receptive ear to its Xinjiang woes in Israel. There are already quiet efforts to learn from the Israeli experience of controlling a captive but resistant Islamic population, such as the recent hiring push for Israeli experts at the Public Security University. Both the U.S. and China have faced and continue to face imminent terrorist threats and each country has its own strength and unique vulnerabilities in facing the surge in international and domestic terrorism. There is solid common ground and ample opportunity for cooperation and support. While the U.S. may need China’s economic and military support in its international antiterrorism operation in the Middle East, China is eager to learn from U.S. antiterrorism measures and experiences to maintain China’s increasingly fragile urban security. Having suffered recently from the bombing in Tiananmen Square in Beijing, the mass murder in the train station of Kunming, Yunnan, and other random acts of mass violence in different cities, the Chinese security forces are exploring more effective preventative measures against terror. The U.S. has a lot to offer in antiterrorism monitoring and policing public space. There are significant policy constraints on bilateral antiterrorism cooperation. The U.S. and China define terrorism differently. Each nation’s political and legal accountability mechanisms for antiterrorism enforcement also vary significantly. China defines terrorism broadly and, importantly, tends to bundle terrorist violence together with the ill-defined categories of religious extremism and ethnic separatism. Given the ethnic tensions that have been boiling in China’s vast autonomous regions, China’s recent antiterrorism campaign is clearly seen as an instrument of ethnic repression. Politically and legally, there is a meaningful overlapping between the action-oriented terrorism and the speech-focused offenses of subversion and separatism, and any U.S. cooperation with China in countering terrorist violence has the potential to implicate the U.S. in China’s domestic suppression of the freedom of religion and freedom of speech. There is still ample room for the U.S. and China to work together on certain core antiterrorism issues. Beyond the international effort in countering the menace of ISIS, there are other opportunities for broader international cooperation in sharing information and technologies and in exchanging best practices. When terrorism is globalized, international cooperation, especially cooperation among powerful states, is inevitable in developing effective antiterrorism measures. A well-crafted antiterrorism program between the U.S. and China not only could enhance the antiterrorism capacity in both countries but also improve government accountability in this sensitive area. The latter point is particularly important in China because there are few meaningful mechanisms, political or legal, to hold security forces accountable. When China is launching an all-out war against terrorism, fundamentalism and extremism without having any effective domestic constraints, international cooperation may serve as the best entry-point for creating some degree of a much needed check and balance. The U.S. and China have provided mutual legal assistance in criminal matters and there have been meaningful cooperation in narcotics control, money laundering, human trafficking and anti-corruption enforcement. There is a sound legal framework in operation for legal cooperation and antiterrorism cooperation is simply another addition to the list. A chasm of mutual mistrust and deep disagreements over policy divide the United States and the People’s Republic of China (PRC) on how to best counter religious extremism and terrorism. It is consequently challenging for Washington and Beijing to work together effectively on developing a global strategy to eradicate ISIS or execute joint counterterrorism operations in hot spots around the globe. Beijing denies that the growth of extremism derives from its own ethnic and religious policies. Instead, it blames internal and external “divisive forces” that undermine the ethnic unity, social stability, and territorial integrity of the People’s Republic of China. The Chinese Communist Party continues to reaffirm the central importance of the state’s program of promoting economic development as a long-term countermeasure against unrest. From a Marxist vantage point, economic inequalities create harmful class distinctions and consequently social instability. One can better comprehend Chinese perspectives on terrorism by examining statements in Chinese vernacular periodicals and journals. Articles on sensitive issues such as the “three evil forces” of separatism, terrorism, and extremism rarely stray from the Party line, which means that such texts provide detailed insight into the ideas that have clout within official circles. Such blunt indictments of the United States are common in Chinese academic journals and periodicals, and reflect growing resentment at perceived U.S. “meddling” in Asia-Pacific affairs. China appears less interested in participating in American-led multilateral initiatives than in working within the framework of the Regional Anti-Terrorist Structure of the Shanghai Cooperation Organization. Unlike the United States, which has strong misgivings about the scope, focus, and possible ramifications of China’s counterterrorism agenda, the SCO member states—including Russia and former Soviet republics in Central Asia—are far more supportive of Chinese objectives and tactics. Unless the United States and China can find common ground on how to cooperate on a counterterrorism agenda, a robust partnership appears extremely unlikely in the immediate future.